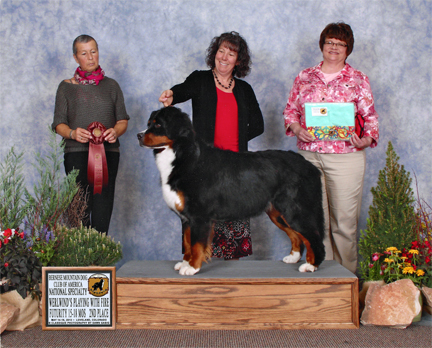 This beautiful girl is Spirit’s Mom Sophie, more formally known as Can Grand Champion Werlwind’s Playing with Fire. Spirit’s registered name is Tailspin’s Winter’s Spirit. Here are a couple more pictures of Sophie at different shows. 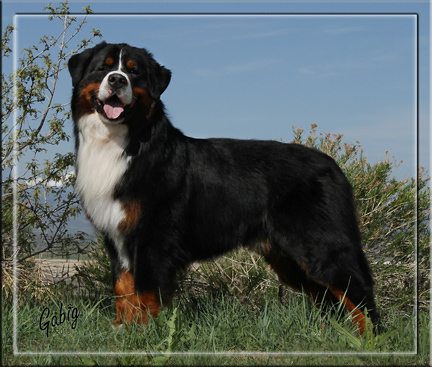 This handsome fellow is the sire Bacchus or Am GCH Alpenspirit Sweet Celebration. 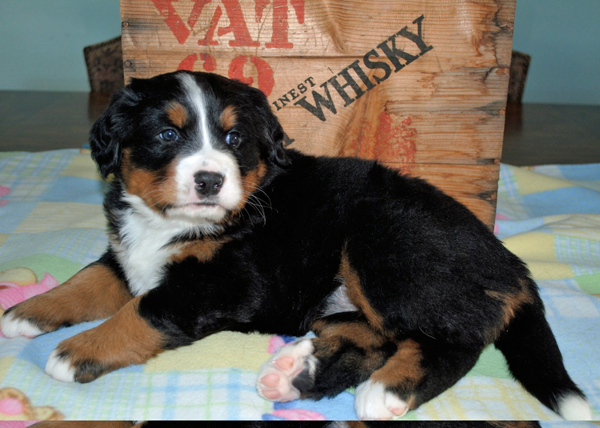 I didn’t realize until I was typing this blog post that Spirit’s name is also part of the Kennel name of her Dad….that’s neat and totally by accident. 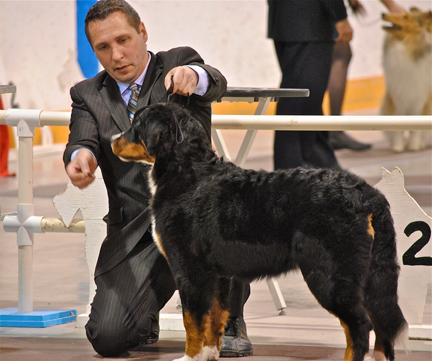 While it is lovely that both of her parents are grand champions, the most important things for me was to find a breeder who really cared about their dogs and participated in Berner Garde. 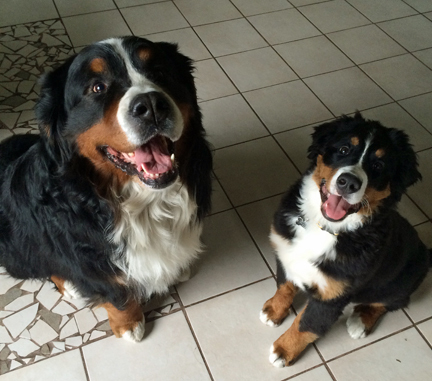 Berners have so many health issues and such a short life span. 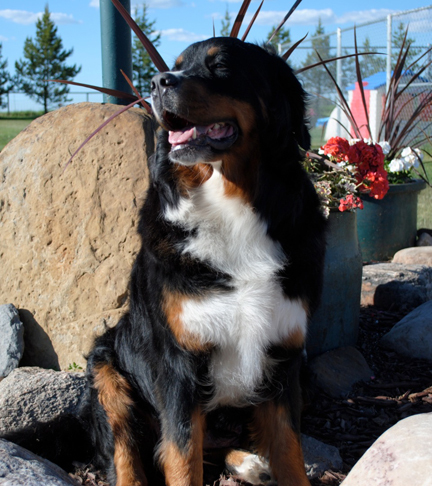 After watching our poor Tango suffer through DM, it was important that our breeder tested her dogs to see if they were carriers of any of the major diseases Berners are prone to. Healthy body and good disposition are the most important to me. 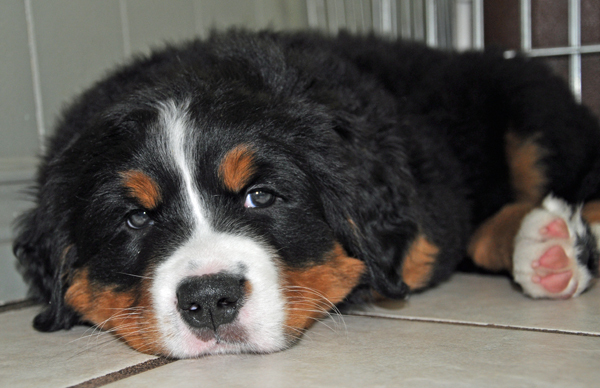 I went through severe withdrawal last week because we didn’t get any pictures of the puppies at 8 weeks old. I saw this one on Facebook yesterday and just fell in love all over again. 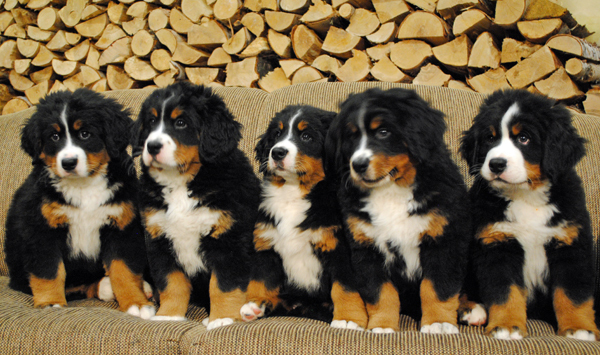 It’s their official 9 week old picture and the last one of the litter together. They are starting to move on to their adoptive homes now. Look at them….so beautiful. Spirit is the one on the far left. Her brother, the one of the far right, is just gorgeous with the wide, white flash on his forehead. He would have been my first pick but he was already spoken for. Only 4 more sleeps until Spirit comes home with us!!!! 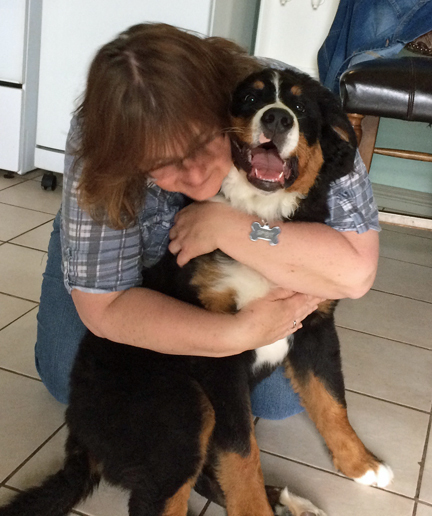 A big thank you to Coreen and Steve Johnson from Tailspin Bernese Mountain Dogs for allowing me to share their puppy pictures on Spirit’s blog. Soon I will be able to take all the pictures I want of our little girl…..ok…not so little. We had our second visit with the puppies today. It was only a few degrees below zero so we got to play with them outside. I was shocked to see how much they grew in 2 short weeks and to see their individual personalities emerge. Spirit is a little timid and quiet but she played a little with Don. They were getting over some tummy troubles so that may have contributed to her quietness. I was able to get a couple of good pictures of her. We now have an official adoption date. Thursday, February 5th at 1830hrs. It is only 17 days away but I know it is going to feel like a life time for me. 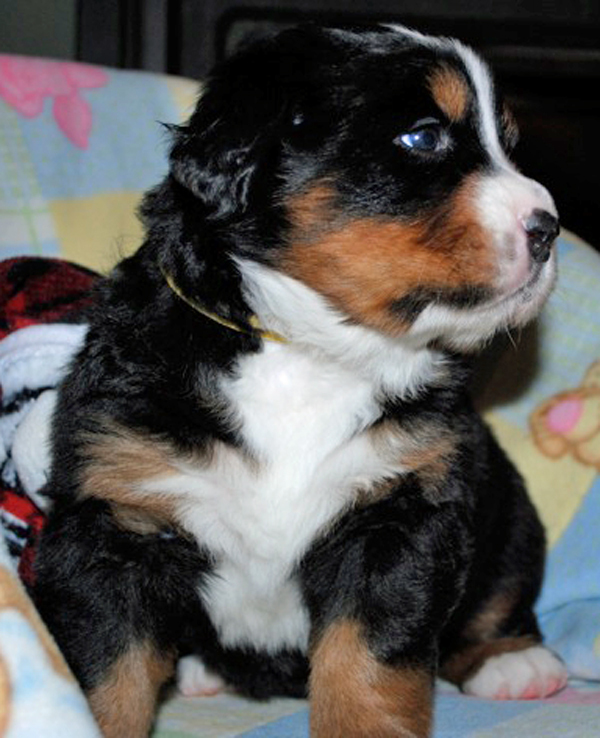 I’m used to getting my puppies much younger but I am sure she will be worth the wait. On New Years day we finally got to meet the puppies. 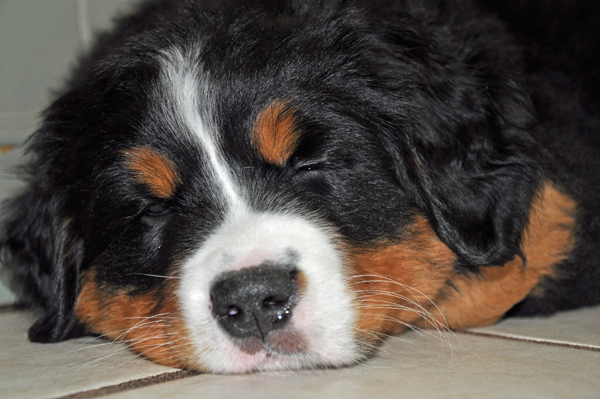 It was heavenly to smooch those little, fat bodies and to smell that amazing puppy breath. 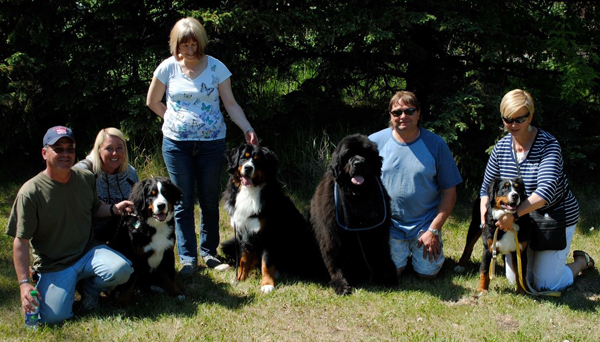 We also got to meet Tailspin’s 5 adults and 1 teenage Berner and their beautiful Newfie. Every weekend I wait for the weekly pictures to arrive from Tailspin. It is shocking how much they grow and mature in only a week.